Reinalda Pires is one determined woman. Her focus, courage and drive has led to her having a very varied and challenging career, all while juggling motherhood and completing a university degree. Reinalda was born in a small village in Baguia and attended school in Viqueque, an area of Timor-Leste around 180km from the nation’s capital, Dili. “My family had very limited economic means. I was the oldest girl in the family and I wanted to go to school to make my parents happy because they worked hard for me to be able to [do so],” she said. After school, university wasn’t an option as Timor-Leste was yet to gain independence, so Reinalda decided to move to Dili to find work. “I started out as a waitress in a restaurant to help out my parents with some money but I thought to myself: Reinalda you can do more than this,” she says. From there Reinalda held a variety of roles with local and international NGOs as well as the Australian Embassy and USAID, before seeing an advert for a job with ConocoPhillips as Business Services Administrator. She had never heard of the company, or the Bayu-Undan Project, and was unsure if she’d make it through. The panel was so impressed they were willing to wait for the then seven months’ pregnant Reinalda to finish up with her current role, have her first child and start several months later, in April 2009. Reinalda was the first Timorese employee to apply for education assistance and be accepted, and she soon commenced her degree in Management Marketing from the University of Bina Nusantara in Jakarta, studying online. “I really struggled at that time as I was pregnant with my second child and had just started studying as well as taking up the role of finance assistant. The deadlines were very tight and it was very busy, as I also had assignments to do and my daughter to look after,” she said. Around that time the role of Purchasing Officer was created and from 200 applicants, Reinalda was the successful candidate. “I needed something more flexible and so I applied for the Timor-Leste Purchasing Officer role. I saw that the role would act as a focal point for local content in the country and that was very interesting to me,” she said. The role was created to assist ConocoPhillips in increasing the number of local suppliers providing goods and services to the Bayu-Undan Joint Venture Project. As the Purchasing Officer Reinalda engages with local suppliers, assesses their capabilities and provides information about ConocoPhillips’ procurement processes and requirements. It is Reinalda’s courage and ‘can do’ approach that has seen her expand her reach into areas such as government affairs, external relations and community investment. 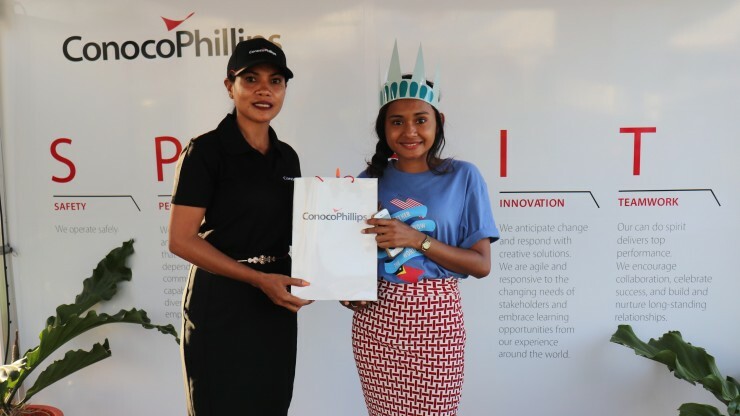 She is also the ConocoPhillips Women’s Network lead in the Dili office, championing diversity and inclusion at a local level. She also cites her family’s never-ending support from day one as a major factor in her success. Reinalda Pires nu’udár feto ida ne’ebé determinadu. Ninia foku, korajen no motivasaun mak lori ona nia ba iha karreira ida ne’ebé variada no dezafiante, iha tempu hanesan nia mós hala’o knaar nu’udár inan no konklui diploma universitáriu ida. Reinalda moris iha suco ki’ik ida iha Baguia no hahú ba eskola iha Viqueque, área ida iha Timor-Leste maizumenus 180km hosi kapitál nasaun, Dili. “Hau-nia família iha meius ekonómiku ne’ebé limitadu tebes. Hau mak oan-feto boot iha família no hau hakarak atu ba eskola hodi halo hau-nia inan-aman sira kontente tanba sira serbisu makaas tebes atu hau bele [halo ida-ne’e],” nia haktuir. Depoizde ramata tiha eskola sekundária, universidade la’ós nu’udár opsaun ida tanba Timor-Leste seidauk hetan independénsia, ne’e-duni Reinalda deside atu muda mai Dili hodi buka serbisu. “Hau hahú serbisu nu’udár empregada-meza iha restaurante ida atu ajuda hau-nia inan-aman sira ho osan balun maibé iha loron ida hau ko’alia ba hau-nia an: Reinalda ó bele halo di’ak liutan ida-ne’e,” nia hateten. Hosi ne’ebá mak Reinalda hahú serbisu ho posizaun oioin iha ONGs lokál no internasionál sira no mós iha Embaixada Austrália no USAID, molok nia haree anúnsiu ba vaga ida ho ConocoPhillips ne’eb’e loke ba pozisaun Administradora Servisus Negósiu nian. Nia nunka rona kona-ba kompañia ne’e, ka Projetu Bayu-Undan, no laiha serteza se karik nia sei hetan serbisu ne’e ka lae. Painél sente impresionadu tebes no sira hakarak tebes atu hein ba Reinalda ne’ebé iha momentu ne’ebá sei isin-rua hela ho fulan hitu atu ramata ninia pozisaun ida atuál, hahoris tiha ninia oan primeiru no hahú serbisu depoizde fulan balun, iha fulan Abríl 2009. “Nia simu feedback ho lailais, amigável tebes no hau kuaze nunka haree iha momentu ruma ne’ebé nia iha mood ladi’ak.” Durante períodu ne’ebá ho pozisaun ida-ne’e mak halo Reinalda bele konsidera hikas fali ideia atu frekuenta universidade no agradese ba kompañia nia programa ne’ebé fó asisténsia edukasaun ba empregadu/funsionáriu. “Ensinu superiór ne’e sempre sai hau-nia objetivu finál no mós hau-nia aman nia espetativa mai hau, maibé hau labele atu selu. Wainhira hau lee iha intranet kompañia nian hau foin hatene katak afinál ConocoPhillips fó asisténsia ba edukasaun.” Reinalda nu’udár funsionária Timoroan primeiru ne’ebé kandidata an ba asisténsia edukasaun nian no ikusmai hetan duni aprovasaun, no la kleur deit nia komesa estuda online ba ninia diploma iha Jestaun Marketing hosi Universidade Bina Nusantara iha Jakarta. “Realmente hau dezenrraskas tebes iha momentu ne’ebá tanba hau isin-rua hela ba hau-nia oan ida segundu no foin mak hahú estuda no mós iha tempu hanesan asume knaar nu’udár asistente ba finansa. Prazus ba entrega nian apertadu tebes no kuazu halo hau okupadu tebtebes, tanba hau iha traballus atu halo no iha tempu hanesan tenke tau-matan ba hau-nia oan-feto,” nia haktuir. Iha períodu ida ne’ebá nia laran mak loke daudaun vaga ba pozisaun Ofisiál Aprovizionamentu nian no hosi kandidatu nain 200, Reinalda mak hetan pozisaun ida-ne’e. “Hau presiza buat ida ne’ebé fleksível liutan no tanba razaun ida-ne’e mak hau hatama aplikasaun ba pozisaun Ofisiál Aporvizionamentu Timor-Leste nian. Hau haree katak pozisaun ida-ne’e sai hanesan pontu fokál ida ba konteúdu lokál iha rai-laran no ida-ne’e interesante tebes mai hau,” nia hateten. “Nu’udár ema Timoroan, hau hakarak atu foti asaun no demonstra katak ConocoPhillips iha duni kompromisu ida ba konteúdu lokál nian.” Pozisaun ida-ne’e kria atu ajuda ConocoPhillips hodi hasa’e númeru fornesedór lokál sira ne’ebé fornese bens no servisus ba Projetu Joint Venture Bayu-Undan. Nu’udár Ofisiál Aprovizionamentu, Reinalda envolve ho fornesedór lokál sira, avalia sira-nia kapasidades no fornese informasaun kona-ba ConocoPhillips nia prosesu no rekezitus ba aprovizionamentu nian. Reinalda nia korajen no mós abordajen ‘bele halo’ ne’e mak lori nia hodi habelar liutan ninia alkanse ba iha áreas hanesan asuntus governamentál, relasaun esterna no investimentu ba komunidade. Nia mós sai nu’udár líder ba Rede Feto ConocoPhillips nian iha eskritóriu Dili, promove diversidade no inkluzaun iha nível lokál.